The Fish Mate P7000 Pond Fish Feeder is suited to larger ponds for use with pellet or ‘stick’ food. Variable feed sizes are dispensed at programmed times or on demand at the touch of a button. 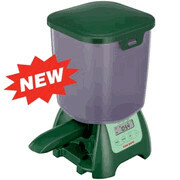 7 Litre (30 cups) capacity dry food hopper.